According to Brad he’s had a few 4X4s but it’s the HiLux that he keeps coming back to. This time around it’s a 2008 model year Lux running Toyota’s 3.0-litre D4D turbo diesel engine. Built with touring in mind, Brad has taken a practical approach with the mods, improving safety, protection and off-road ability. The brakes have been upgraded to Prado units and braided steel extended brake lines have been fitted to handle the move to a 4″ suspension lift and help reduce pedal travel. That 4″ suspension lift was achieved by fitting a Dobinson lift kit to the front that includes their popular remote reservoir MRR shocks. Rear springs are TJM 350kg constant load units with a matching pair of Dobinson MRR shocks keeping them in check. Brad is currently running 16″ Sunraysia steel rims with a negative 13 offset and as he describes them “cheap 285/75/R16 muddies…”. 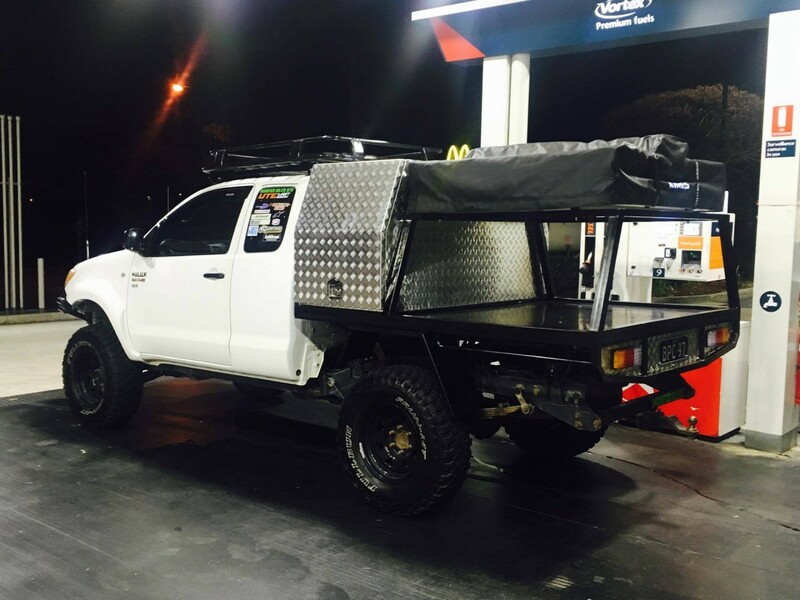 Protection is a serious subject for Brad and he’s got the HiLux covered with a custom made 6mm (you read that right) underbody bash plate. An X-rox steel bull bar protects the front and improves the approach angle considerably. 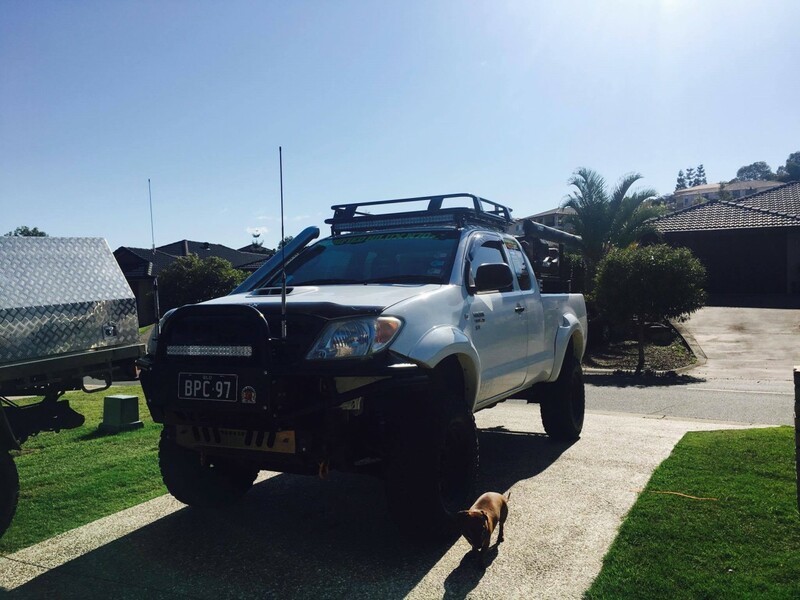 Brad likes a good LED light and that’s why he’s fitted a swag of them to the Lux, including a 42″ roof mounted light bar, a 22″ bull bar mounted light bar and a 22″ rear mounted light bar. The ‘juice’ keeping the lights on is provided by a Redarc dual battery system. Out the back there’s a custom made steel tray built by Salter Engineering on the Gold Coast. It’s fitted with a 1700 x 800 alloy canopy which houses the 80-litre Waeco fridge/freezer and slide. 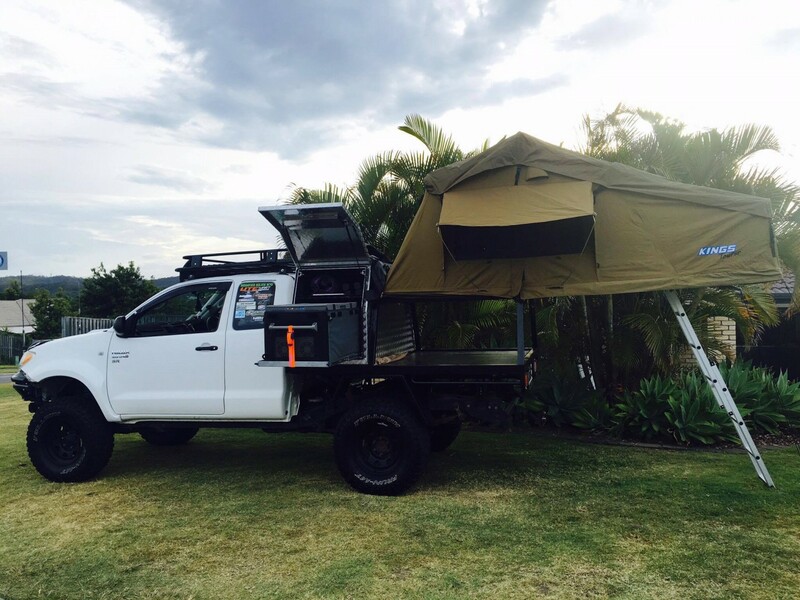 An Adventure King rooftop tent ensures that Brad always has a roof over his head.